Decorative kitchen countertops made by Counterpart LLC, located in Raleigh, N.C. Counterpart uses CSA cement exclusively. 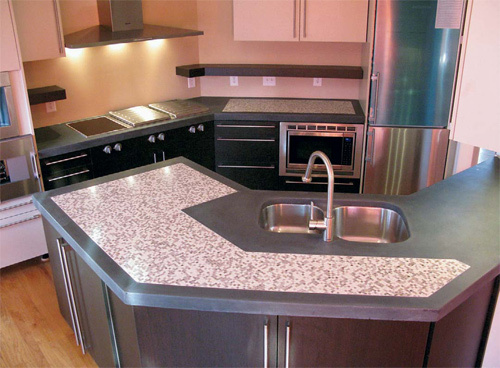 According to Jeffrey Girard, P.E., founder of The Concrete Countertop Institute, concrete with calcium sulphoaluminate (CSA) is the way to go for countertops. "When I first used CSA instead of portland cement, I recognized that it offers a technological advantage," he says. Girard should know. A civil engineer by training, he built his first countertop for his own house. Before long, building countertops was his main source of income. He changed his focus to the teaching side of the business about 5 years ago, establishing the Institute in Raleigh, N.C.
A kitchen bar-surround countertop by Innovative Concrete Technologies. It was made with 25 percent CSA cement. "Whether I was manufacturing countertops for my own use, fabricating them as a business, or teaching others about concrete countertops, I've always focused more on the technical side rather than the artistic," he says. "From the time I fabricated my first countertop, I've noticed a propensity in the decorative concrete field to focus more on the artistic to the detriment of the technical aspects. In my opinion, the perfect countertop is one that is the result of an equal focus on both." When Girard touts CSA, he begins by praising it as a fast-setting, high-early-strength binder option. "Concrete made with CSA often achieves compressive strengths in excess of 5,000 psi in 24 hours," he says. "With CSA it's possible to achieve 28-day strength in 24 hours. 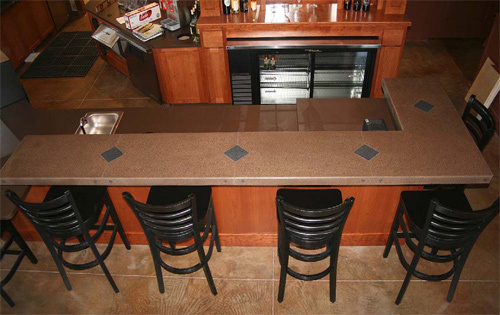 Using CSA, the concrete countertop artisan can increase form turnaround significantly. You can have your product out the door almost as fast as you can make it." Girard says there are more advantages to using CSA than just speed. "From an environmental standpoint, CSA is far greener than portland cements. Also, unlike portland cements, CSA cements do not produce calcium hydroxide, and that reduces problems like cracking, curling and efflorescence." An ornate sink-surround countertop made by Counterpart LLC. Dave Banko, owner of Counterpart LLC, based in CCI's Raleigh training facility, started using CSA two years ago. He switched completely about 10 months ago. "Even for a relatively low-volume shop like mine (seven to 10 pieces per month), the time savings offset the higher cost of CSA versus portland. I recently did a countertop with CSA using glass fiber. I poured the concrete around 7 p.m. and the next morning I processed, grouted and was ready to seal by that afternoon. With portland, it probably would have taken about four days to do that." On the other hand, Jim Ralston, of Urban Concrete Design in Phoenix, Ariz., has been in the decorative concrete business since 1986. He's tried CSA and decided to stick with glass-fiber reinforced concrete (GFRC). "You might get twice as much out of your forms and molds if you really work at using CSA, but I don't really have the need to do that. Using an acrylic curing compound with glass GFRC I can pop the forms in about 17 hours. CSA requires a complicated mix design - definitely not for the novice. I understand the drive behind it, the fast set time and early high strength, but I'm comfortable with the way I'm doing things." Girard believes the quality of CSA concrete is better than that of portland-based mixes. "CSA has a higher flexural and tensile strength, and it's harder. Because of those factors, countertops made with CSA-based concrete aren't prone to cracking or curling, which can be an issue with countertops made with portland. And because CSA results in a harder concrete, it's less porous." he says. Mike Heidebrink, president of Cheng Concrete, says there is a place for CSA in the high-end decorative concrete industry, but that it also has its negatives. "We've been using CSA as a component in some of our projects, but when it's used as a stand-alone ingredient, we've found that it lacks the tone and richness of depth that we try to infuse in all our projects. That being said, I expect CSA will somewhat mirror our experience with GFRC - at first it didn't quite meet our aesthetic requirements, but we saw the potential. We experimented with it and ultimately came up with good results. We're currently developing CSA techniques and blends much like we did with GFRC." Jon Schuler, owner of Innovative Concrete Technologies in Murphys, Calif., started out building countertops and other high-end ornamental concrete products. He discovered that he had more success with his own cement blends, stains and sealers, and he eventually added manufacturing of supplies to his company's profile. "I'm pro-CSA," he says, "I like the increased reactivity, higher density, early strength, and stain resistance - speed is really a side benefit. But I can't use a straight CSA blend for what I do. With my own blends I can achieve the quality I want, yet manipulate the set time to anywhere between 30 to 120 minutes. "Everyone should have knowledge of CSA cements and CSA-cement blends. They will become the cornerstone of our industry. As concrete continues to grow in popularity, quicker, more efficient turnaround will become necessary to supply demand, but product quality has to be maintained. CSA cements and CSA blends will satisfy both." "Overall there are a number of benefits with CSA cements," says Murray Clarke, owner of Delta Performance Products LLC, a Georgia-based specialty admixture and color component company, and its Web site Blueconcrete.com. "CSA is close to 50 percent greener than portland cements (as it's fired at a much lower temperature than portland). Color additives are constantly being developed and available options will continue to grow. CSA cures more completely than portland mixes. The surface is superior and long-term color fading is dramatically improved. "As a percentage of the total cement market, CSA is still a relatively small, but growing, segment with no end in sight." "Your customers want to feel like they're getting their money's worth," Girard says. "They want to be happy with your product tomorrow, next week, next year and in five years. 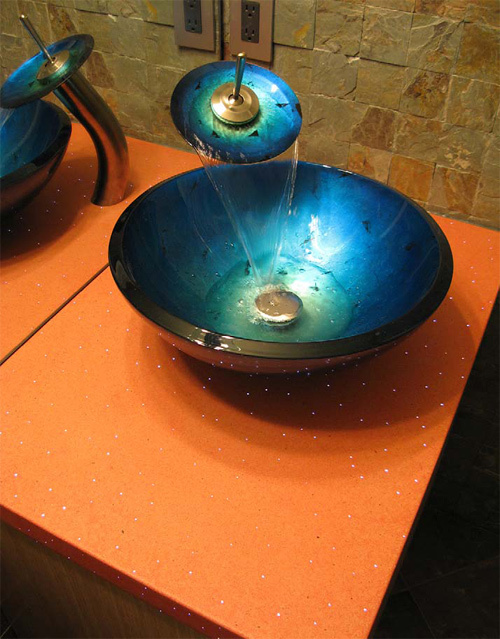 The challenge in the concrete countertop business has always been to make something visually pleasing that stands the test of time. CSA is the obvious next step."